With so many broadband enabled devices capable of streaming content to the living room, I thought it would be a good idea to let attendees to next week's Streaming Media West show the ability to get hands-on with as many of these devices as possible. I'm happy to announce that we've set aside some space on the exhibit floor, booth 416, where attendees can see content offerings available on the Xbox 360, TiVo, Roku, VUDU and FLO TV. 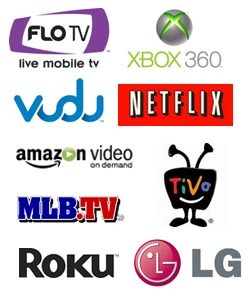 Stop by and see 1080p streaming on the Xbox 360; Netflix and MLB.TV streaming on the Roku; Amazon On Demand and Blockbuster streaming on TiVo; VUDU's HDX quality on a broadband enabled LG Blu-ray player; and FLO TV's new personal television. I'll be at the booth showing off these devices, doing demos and representatives from these companies will be there at times as well. This is a great opportunity for anyone who's never been hands-on with these devices and platforms to see them in-person and I thank these companies for providing us with the hardware. If you have a device you want to have featured in our device pavilion, for free, contact me ASAP. It's not too late to get a pass to the show and readers of my blog can register using my own personal discount code of DRF1, which gets you $200 off the ticket price. You can attend all three days of the SM West show for only $695 or get a FREE exhibits pass which gets you into the show floor, all three keynotes and the networking events.